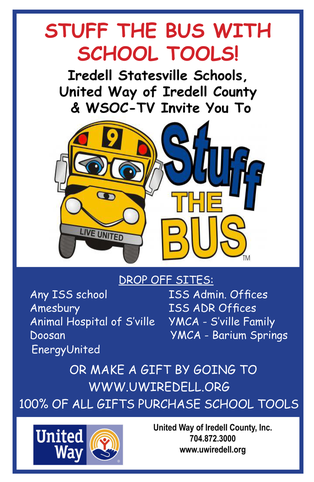 United Way of Iredell County and Iredell Statesville Schools participate as partners in the annual Stuff The Bus Campaign. Through the generosity of several local companies placing barrels at the workplace and local citizens filling barrels at various locations; several thousands of pounds of school tools are collected for students. Once barrels are stuffed, the school bus will travel around to all locations collecting the donated school tools. If you would like to make a monetary gift to the school tools drive please click on the button below. 100% of all gifts go directly to the distribution of school tools! Contact us to become a host location!